Garden Sheds Direct is one of Irelands leading manufacturers of Garden Sheds, Cabins, Stables, Offices, Fencing Panels, Tree Houses, Summerhouses, Chalets, Wendy Houses, Garages, Pigeon Lofts, Workshops and Potting Sheds. Garden Sheds Direct has over 30 years experience in the business and have a track record second to none. Our manufacturing facilities are based in Wicklow where the Garden Sheds Direct product range is made from the best of Irish and Imported timber. Garden Sheds Direct strives to bring you, the customer, quality products at reasonable prices. We offer you an inexpensive means of increasing the storage space in your home. A Garden Sheds Direct designed Shed which offers a classic looking shed while giving ample storage for the average home. This Garden Sheds Direct Rustic Shed is the affordable one that is ideal for your Garden Tools and Mower. Garden Sheds Direct offers this Barrel Board shaped Timber which adds that extra feature to your Garden Shed. Garden Sheds Direct offers this stylish Shed which suits many needs and with Window Boxes to add that bit of colour. Garden Sheds Direct has introduced this shed to give customers a Classic Shed at a very attractive price. The veranda is included in the overall size of the shed but the veranda size can be increased to suit your requirements. Garden Sheds Direct can manufacture this Wendy House to your requirements and even with different types of finish. A practical building for maximum use of space with extra height and a window which can be located where you want. This Garden Room which was recently supplied by Garden Sheds Direct is also suitable as a Games Room or Office. Garden Sheds Direct has supplied this building, which is used for Storage and as a Workshop, in Pressure Treated Shiplap and with Onduline Roof Sheeting. We can also supply the Building in Barrel Board Shiplap and with Box Profile Roof Sheeting. This Pressure Treated Shiplap 4 Stable building can be manufactured and installed within a very short time and can be extended and even returned in L shape to offer a very cost effective building for your horses. Tack room can also be installed in the Stables. Garden Sheds Direct can supply this Garage in various sizes and finishes. A Tree House that give children hours of enjoyment. 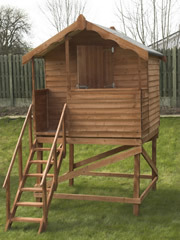 Garden Sheds Direct can supply the Tree House in Shiplap or Barrel Board Timber . 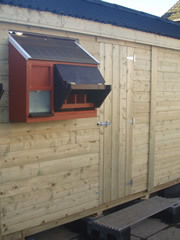 Garden Sheds Direct has supplied many Pigeon Lofts in Ireland and can manufacture a loft to your specific requirements. No matter how small or Big we will be happy to give you a quotation. Garden Sheds Direct can supply this Shed In various sizes and finishes. The Potting Shed provides the facilities for the gardening enthusiasts in all kinds of weather. Aside from the standard range of garden buildings, Garden Sheds Direct can manufacture to your specific requirements. Garden Sheds Direct carry a full a range of Fencing Panels and Decking products. We can supply and fit or just supply. 087 949 2617 or email info@gardenshedsdirect.ie for details.